“Demystifying Dissertation Writing” sits on my shelf of ‘how to’ books. Stylus publishing donated a copy to Dr Charlotte Frost and Dr Sarah Quinell, of PhD2Published, kindly organised for a research student to receive a copy and review it for the Thesis Whisperer. This book is subtitled “A Streamlined Process from Choice of Topic to Final Text”. It is aimed at postgraduate students in humanities and social sciences. So, I was expecting it to be a treatise on ‘how to write your PhD thesis/dissertation’ without any effort. And it mostly is and it offered me some fresh insights. The book focuses on the writing process, on starting, writing and completing your thesis/dissertation successfully in a systematic way that maxmises your time and effort. It is interesting to see what it does not cover: how to start, undertake and complete your PhD, or more detailed topics such as research methods methodology, data analysis or undertaking a literature review (although it encourages the reader to think about these in developing an outline and suggests how to organize and analyse your notes). The book is written from a US perspective, and non-US readers will occasionally have to provide their own parallels with doctorate process they are following. The author is a graduate teacher and knows and understands her students and the challenges they face in writing a dissertation. This book provides practical advice. For many readers it sits alongside with “Authoring a PhD” by Patrick Dunleavy and “How to Write a Thesis” by Rowena Murray. This book offered me some new tools and approaches that I could apply immediately, particularly the focus statement, a short summary of what your research topic is about in plain English, and a one page outline of your dissertation (although other books cover this as well). The strength of the book lies in its focus on the writing process. It offers approaches to and ways of exploring your topic, refining the scope and the boundaries of a research project, and offers hints for effective reading and note-taking. Peg Boyle Single stresses the idea of establishing a writing routine, working with fellow students and overcoming writers’ block. She aims to support the reader in becoming a fluent writer. She also covers choosing a topic and a supervisor, developing a detailed outline, different approaches to take to thesis (thematic, data analytic and journal article). The most immediately refreshing perspective is that the author recognizes that PhD students have other dimensions to their lives; that their research and their thesis are only one of several elements which they are juggling. Like other books in the field, , working ‘little and often’ and ‘start and keep writing’ are the keys to a completing a thesis/dissertation. Peg Boyle Single writes clearly and her suggestions are practical. This is not a high flown theory book; it is practical, accessible and easy to read. I read it in several short sessions and found myself sitting down to use and develop some of the tools and concepts that she describes. This book provides a very useful practical introduction for postgraduate students. This kind of book helps to fill a gap that exists on many graduate courses at Masters and PhD levels; learning about how to write, the writing process and how to manage this. I would recommend this book along with Patrick Dunleavy and Rowena Murray’s books as essential reading and material for new PhD /postgraduate students, and those in the middle or later stages of their doctorate who are struggling in to get to grips with the dissertation/thesis writing process. As the author uses generic techniques, the book also provides a good starting point for Masters students. 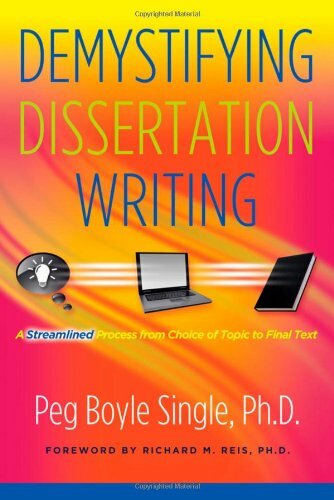 The writing processes and management techniques and approaches that Peg Boyle Single describes have wider application; they can be used for other kinds of writing projects. At just over 200 pages, this is a book to skim at first reading for an overview, and to come back to for advice on particular topics. However, if you are looking for greater insight into doing PhD, then you may prefer to refer to other books such as “The Unwritten Rules of PhD Research” by Marian Petre and Gordon Rugg. Do you have other suggestions for good books for PhD students to buy, or own a book you like so much that you want to review it for us? Let us know in the comments! A Roadmap From Beginning to End” by Linda Dale Bloomberg and Marie Volpe (2008) very helpful. Very practical and readable. Thanks for the tip – I’ll look that one up. I am very impressed with the way you efficiently blog and your posts are so informative.